This section of BBQMyWay.com will cover great barbecue chicken recipes as well as recipes from other types of poultry, such as turkey, Cornish hens and more. Poultry in general is inexpensive and versatile, and barbecue chicken is a "hallmark" of southern barbecue cooking. While we will cover recipes for all types of poultry, the main focus will be on chicken, and lots of barbecue chicken and grilled chicken. In case you are interested, chicken is one of the oldest and most frequently domesticated animals in the world. In fact, there are over 22 billion chickens worldwide. 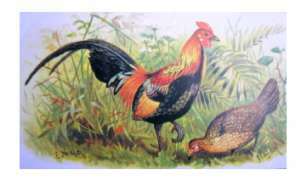 The domesticated chicken can trace its lineage back to the "Asian Red Junglefowl," which is pictured on the right. Practically every part of the chicken can be consumed, and the bones can be simmered with spices and vegetables to create fresh chicken broth. When doing this, hens are suggested. Buffal Chicken Recipe - "Buffalo Bacon Backers™"
Leave Barbecue Chicken and Return to BBQMyWay Homepage.